Kitchen & Beyond ... 8,574-sq-ft showroom. The revamp of one of the largest design kitchen showrooms in the UAE has been driven by a desire to create a sense of space – one with a distinctive character of its own. 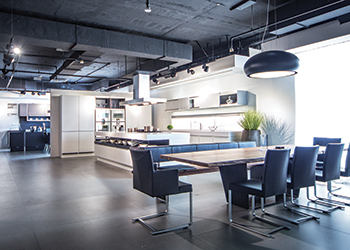 Located on Dubai’s Sheikh Zayed Road, the newly-renovated Kitchens & Beyond showroom recently opened its doors showcasing the versatility and aesthetic appeal of the portfolio of products the company offers in its very interior décor. Kitchens & Beyond has been the sole dealer for Poggenpohl for over 40 years. It is also the exclusive dealer for many luxury brands, including Italian kitchen cabinet maker Aster Cucine as well as custom walk-in closet manufacturer Fimes, Grand Cuisine by Electrolux, Gaggenau, Sub Zero & Wolf, Miele, Quooker, Kohler, Dornbracht taps, Liebherr (refrigerators and freezers) and Cosentino. The facility showcases a choice of lifestyle design concepts. Spread over 8,574 sq ft, the showroom features Cosentino surfaces throughout, setting a new benchmark in design, professionalism and functionality, says the spokesperson. The showroom features two new timeline walls. The first wall showcases the heritage of Poggenpohl over the years, the first German kitchen brand established in 1892 by Friedemir Poggenpohl. The wall also showcases the present and the future. The other featured wall is situated in the middle of the showroom and is clad in Dekton stone. “The idea behind this wall was to exhibit different artists’ work, to create the feeling of a private art gallery. Such expositions may present pictures, drawings, video, sound, installation, performance, interactive art, new media art or sculptures by individual artists, group of artists or collections of a specific form of art,” the spokesperson adds. The showroom has been redesigned by Gjorgji Romanov Senior, Alisha John and Rebecca Crespo. The client’s brief was to showcase true working lifestyle design concepts, allowing the customers to engage and interact by touch and feel, with working demo mode displays. Designers were also tasked with creating the right mood, lighting and space throughout the showroom. “The main design feature captured throughout is the use of Dekton and Silestone surfaces designed by Cosentino including the flooring, cladding, worktops, splash backs and vanity sinks. According to the spokesperson for Kitchens & Beyond, the projects market accounts for nearly 40 per cent of its business. “Last year, we experienced growth in business as we supplied to a number of high-end projects, including five-star hotels apartments,” he adds.